Articles added to My Orator are automatically synced to your personal podcast feed so that you can listen on any device. Organize your articles so that you can play them as a playlist. Sync new bookmarks from your Pocket account. Yes, you can play your tracks on your Amazon Echo! My Orator empowers you to make your own choices about what you want to consume and how to consume it. Will this work on iOS/Android? Yes. For now, there is no 'app' - the site is where you can edit your playlist. Launch Safari and go to myOrator.net - put it on your home screen for quick access. 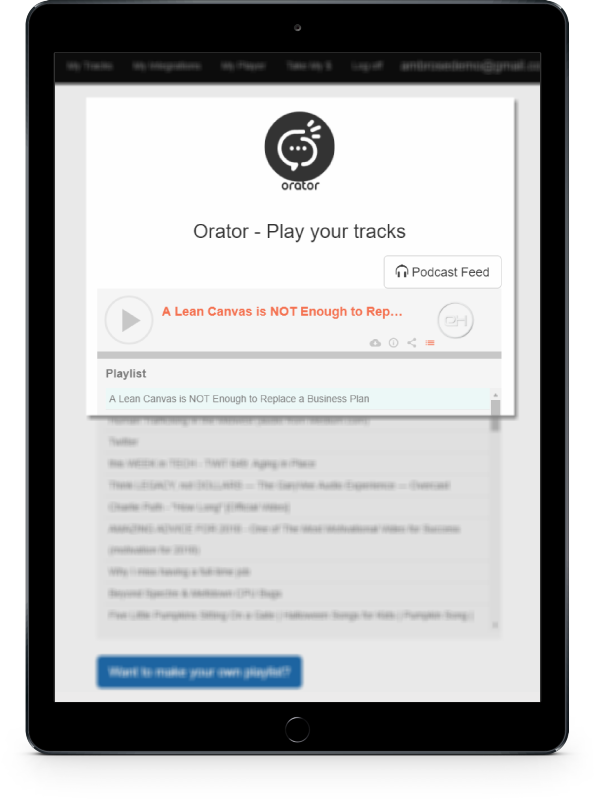 You'll then add the podcast feed (from the Orator site) to your podcast app. After that, you'll share articles via Gmail to the Orator email address and the links will be added to your podcast. I admit that the setup is cumbersome, but it's just a one time thing. What if it doesn't work on my favorite site? Different sites lay things out differently and no parsers are perfect. If My Orator does not convert the intended text, just holler at me on Email, Twitter or Facebook and I will fix it personally. I will credit back any content that Orator incorrectly reads. There is no credit card required to try. All you do is login with your Google account. You'll get 35 minutes of conversion time instantly so that you can start using it right away.